Home > Black & White, Cityscapes	> Reversal of Misfortune. Here is one more image from my series: Cityscapes. 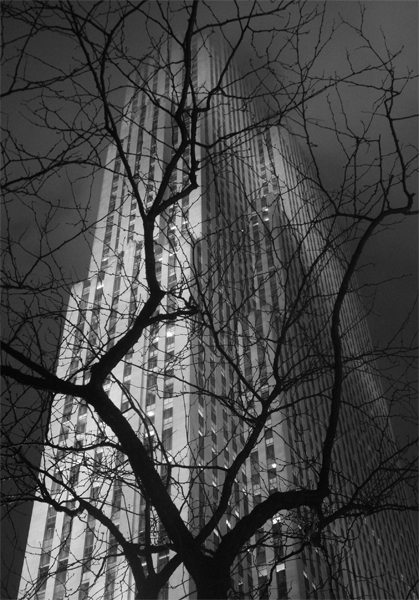 When fog fell on Manhattan one night, I had envisioned capturing some great images from atop 30 Rockefeller Center, the home of NBC and the comedy TV show 30 Rock. After enthusiastically arriving at the ticket desk to purchase entry to the Top of the Rock, 70 stories up, the sales person advised us that there was zero visibility up there and although they would sell us tickets, they would not return the money once we confirmed that we could not see anything past our noses. Taking their advice, we disappointedly exited the building toward Rockefeller Center. Once outside, I looked up and confirmed that the top floors had vanished into the fog. Notwithstanding this fact, and to my absolute delight, the building looked spectacular bathed in light as it disappeared into the sky. Now, I have photographed this iconic edifice under various conditions, through Christmas lights, in snow, and simply by itself on a clear night. But this night, illuminated and ascending into the fog, it was magical. Although I created great images that evening of the building standing alone in the fog, it was only when I scouted the location to find a suitable foreground subject that serendipity occurred. Finding a bare tree across the street to silhouette against the building created the perfect (photographic) storm. This image has appeared in Black & White Magazine, in a Fine Art Gallery Exhibition and a custom commissioned print hangs in a spectacular New York City apartment overlooking the skyline of which it is such an iconic part. The moral of the story is, when things are looking bleak, keep your head up, you never know what you’ll find. In this case, for me, it was clearly a reversal of misfortune. Beautiful and iconic shot Barry – thanks for sharing! I work right in Rockefeller Center, so this is something I see daily but never really stop to shoot!